About — deckchair productions - make it easy, make it smart. Deckchair operates as a versatile creative consultancy to brands, talent, companies and organisations. Executing tailored projects, from budget management to talent management. For magic circle law firms to A-list superstars. We work selectively, where we feel we can add value. Delivering meticulous service at every level of the creative process, often organising a myriad of teams and agencies with efficiency, confidence and discretion. Sometimes we help polish something. Sometimes it's to win business. Other times, it's an analysis to justify a campaign. From script-writing, to speech-writing. From specialist presentations to brand-building and business development. From idea generation, to design thinking. We innovate, we implement, we grow. And still ultimately, it is for style, quality and direction, that people choose Deckchair. Deckchair offers expertise evolved from independent feature film production, and over 600 commercial films for corporates and brands in the online era. We've covered it all and have the best talent at our fingertips. We are proud the track record speaks for itself, and whilst always looking for the next challenge, we hope very much to hear from you. Music stars: Mark Ronson, Florence & The Machine, Lily Allen, Rudimental, Joe Stilgoe. TV stars: James Martin, James May, Olly Smith, Tom Parker-Bowles, Arlene Phillips. Actors: Sue Johnston, Amanda Burton, Dougray Scott. Sports stars: Freddie Flintoff, James Haskell, Graeme McDowell, Henry Blofeld. Nobel prize winner: Elizabeth Blackburn. We also collaborate with clients across advertising, entertainment and the arts to create film, interactive and original content. Our films pioneered the first interactive augmented reality edition of the Mail on Sunday and Mail Online, the world’s largest online newspaper with over 100 million monthly readers. Independently we have produced award winning drama, documentaries, commercials and music videos, with our teams of BAFTA & OSCAR nominated directors, writers, editors cinematographers, designers, musicians, animators and production management. 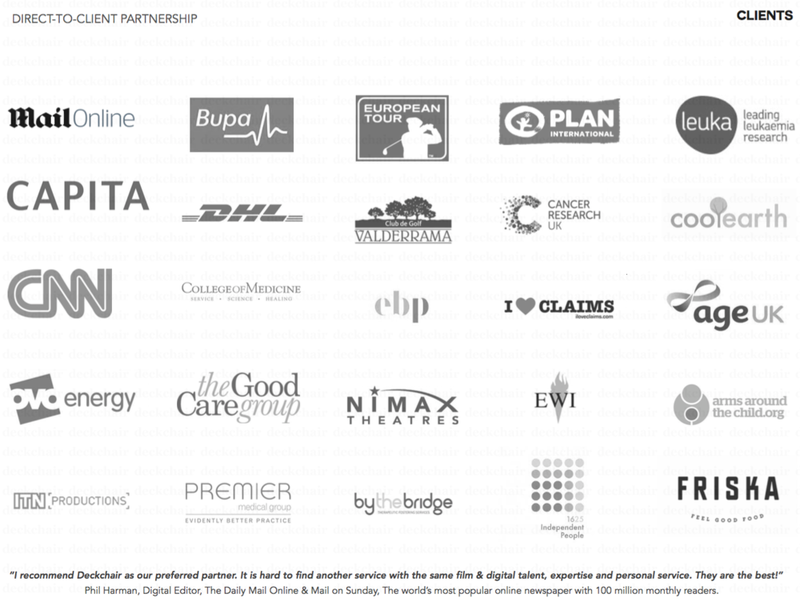 In turn, we are able to connect brands with talent, and work with charities we care about.